Are you looking to start or expand your garden this year? Lets go down the check list of things we might need - potting soil, seed plugs, seed trays, grow lights, compost, peat, vermiculite, fertilizer, manure, pest sprays, raised bed kits, trellis, tomato cages, and on and on....... I remember the first time we decided to have a small garden in one of your flower beds. We started at the store buying seeds and dirt and all of the things we thought we would need and spent about $100. That year we barely had anything grow and forgot to have someone water while we were on vacation. Not a great first experience but we were determined to start again. In our new home a few years ago we decided we were going to go big and year after year we are adding more and more to our garden. But we aren't huge fans of spending $10 in supplies to get $5 worth of vegetables, anyone else feel like that when you are starting out? Yes, over time you get things that you can use over and over each year thus making it more and more worth while. But what about now, do we really need all of this stuff to get a garden going? In my opinion most people (including us) spend way more than they need on gardening supplies and then are disappointed at the results their first couple of years. It does take time to get the soil just right, it takes time to learn what works best and when to plant and harvest. Gardening is not something that you can just go out and throw some seeds in the ground and have an awesome garden your first year. It takes time and in some cases a small amount of money. I have found that you have a choice in many cases, time or money. We are expanding our gardens over time as to lessen the impact on our wallets and allow us time to develop good soil as we expand. We have also learned that while we are not going to win any awards for the prettiest seed starting operation you can get started with little to no money invested at all. We started saving any containers with clear plastic lids last year and have saved up quite a few of them by now (probably more than we need!) These make the perfect tiny greenhouse seed starting containers. 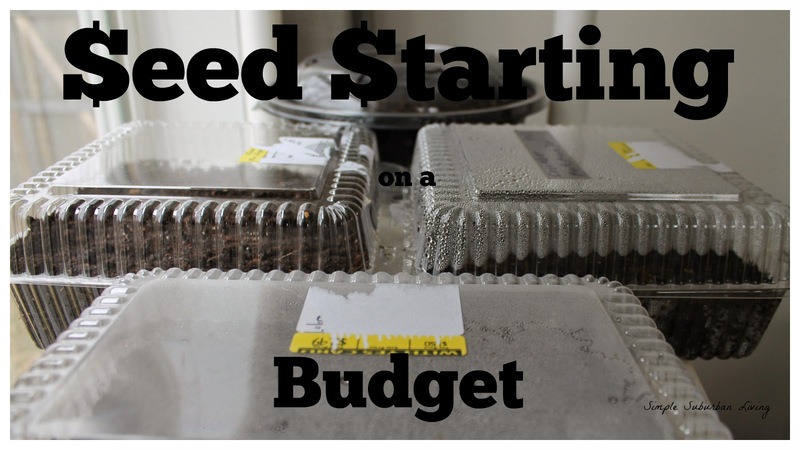 Instead of buying a heating pad and seed starting trays just use the things you already have. We have found these to be the fastest way to get your seeds started! This year in fact most of our seeds were already popping through the soil in the first 48 hours. The next thing you need to get your seeds started is soil, there are a lot of different ideas with what works best here but again I just use what I have to get going. Last year we made a mix for our square foot gardens of our compost, vermiculite, and peat. I grabbed a bin full of this soil and brought it in as soon as it was no longer frozen. I sifted through and got out any large pieces (leafs, sticks, etc.) and then filled my containers. The only down side to using this type of soil is that you might also germinate a few blades of grass or something from last years planting so just be carful and pay attention to what sprouts. If one of these things is not like the other, pull it out. Seeds are pretty easy to come by and don't be fooled by expiration dates on those seed packages. With proper care there is no real expiration to most seeds. Germination rates might be lower after a few years but I wouldn't worry too much about that. Look for seeds during the off season in the fall or winter. Most stores have clearance sales at this time and you can get your seeds for as much as 75% off. You can also save seeds from your plants year after year. This is a skill I have not yet mastered but will be trying some of this year. I hope that this has inspired you to get started or add on to your garden this year. Follow along for more tips and tricks this coming spring and summer and lets all try to feed our families a little more from our garden each year. Love your makeshift seed-starter containers! I've struggled with keeping them moist in the DRY Denver air...that'd be perfect! Will have to keep my eye open this year to when I have appropriate containers. This year I used egg cartons and sour cream containers...it gets the job done, but I get antsy waiting for the seedlings to pop up. It is true that it's way too easy to spend too much. I'm also going to try saving seeds this year, once I learn how. I have a friend who does it some, so will have to tap her as a resource. We are using some egg cartons and sour cream containers this year as well! All of our seeds have been sprouting really well in those mini greenhouses and we are getting ready to start planting outside soon!